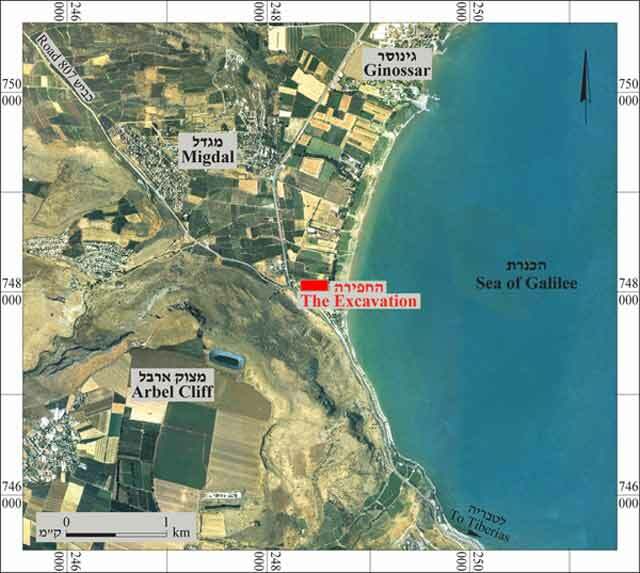 During 2009–2013, several seasons of a salvage excavation were conducted in the northern part of the Migdal antiquities site, on the shore of the Kinneret (Permit Nos. A-5718, A-6022, A-6098, A-6599, A-6683; map ref. 248319–596/747984–8148), prior to the construction of a hotel. 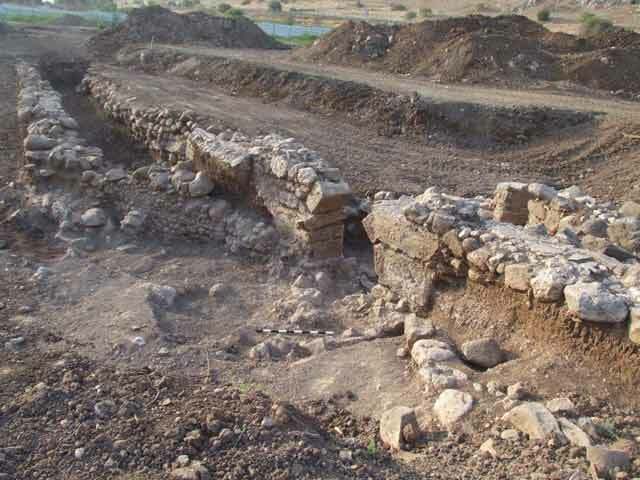 The excavation, undertaken on behalf of the Israel Antiquities Authority and underwritten by the Ark New Gate Company, Ltd., was directed by D. Avshalom-Gorni and A. Najar, with the assistance of Y. Ya‘aqobi (administration), R. Mishayev and Y. Nemichnitzer (surveying and drafting), M. Hartal (field photography), Sky View Company (aerial photography), Y. Gorin-Rosen (glass), D. Syon (numismatics) and J. Neguer and R. Abu Di’ab (fresco and mosaic conservation). Thanks to M. Zapata of the University of Mexico for allowing the publication of her excavation areas in the general plan. The Migdal antiquities site extends across the northwestern shore of the Kinneret (Hawaii Beach), to the foot of the eastern slope of Mount Arbel (Fig. 1). 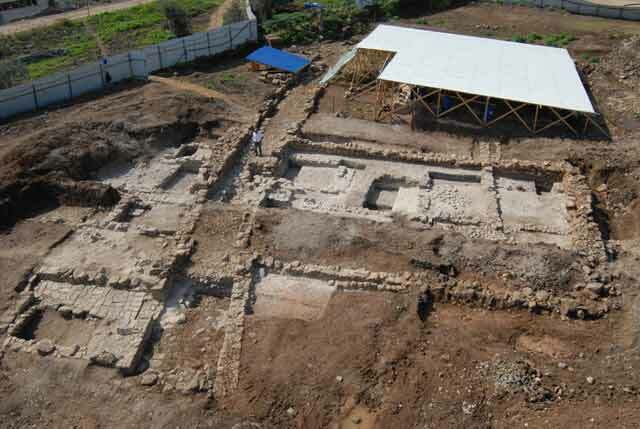 The site is identified with the settlement Migdal Nunia (Taricheae), which was the only urban center along the western shore of the Kinneret until the founding of Tiberias in 19 CE. The settlement from the Early Roman period is mentioned in Jewish sources—at the time of the Great Revolt it was the principle base of Josephus in his war against the Romans in this region. The settlement is also mentioned in Christian sources because according to Christian tradition, Mary Magdalene, who was one of Jesus’ major supporters and was known as the "Apostle to the Apostles", was born in Migdal. The Franciscan Institute conducted the first excavations at the site in the early twentieth century (De Luca 2009). 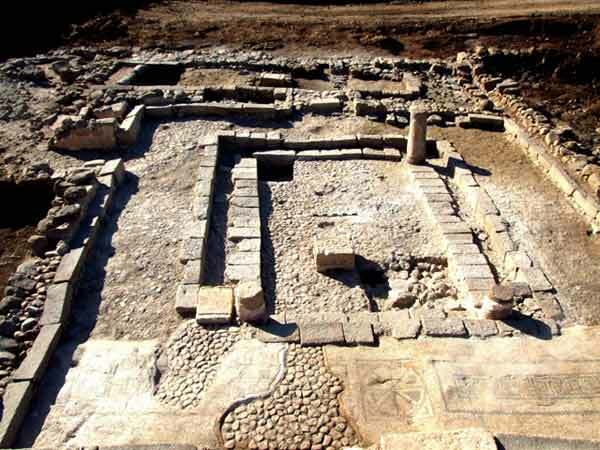 The excavations that were carried out in 2002 and 2006 (HA-ESI 117; HA-ESI 121) showed that the settlement at Migdal was established in the Hellenistic period and reached its zenith in the Early Roman period. The settlement continued to exist, albeit on a smaller scale, in different periods until the Middle Ages. 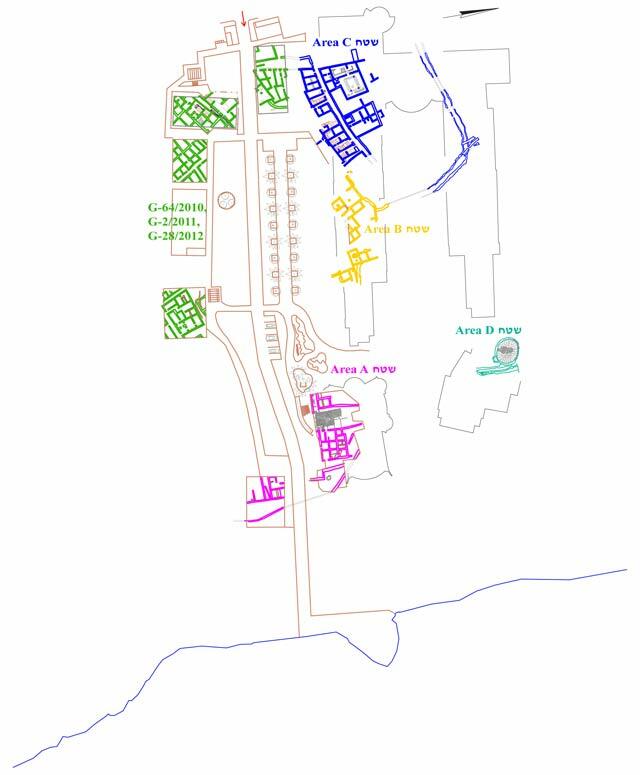 During 2010–2012, the University of Mexico, in cooperation with the Israel Antiquities Authority, conducted excavations in five areas just south of the current excavation (License Nos. G-64/2010, G-2/2011, G-28/2012). Four areas (A–D; Fig. 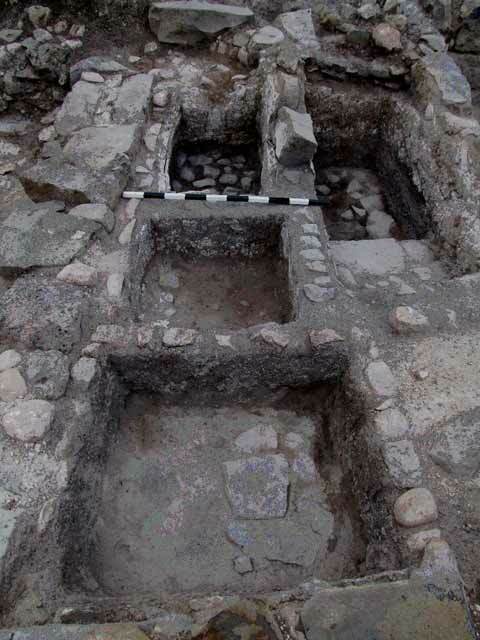 2) were opened in the current excavation and four settlement strata were exposed, dating to the Hellenistic (Stratum 4), Early Roman (Stratum 3), Late Roman (Stratum 2) and Byzantine (Stratum 1) periods. 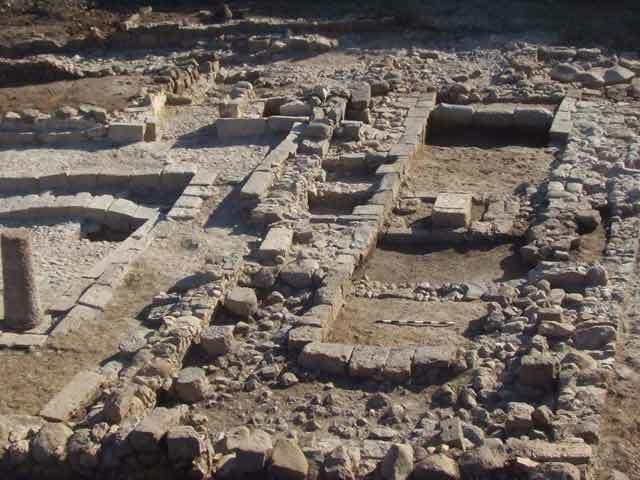 Extensive portions of the northern quarter of the Early Roman settlement of Magdala were uncovered in both of the excavations carried out in recent years. Meager remains, including several foundations of walls built of round stones and potsherds were discovered. Area A.A stone-paved open area, possibly a street aligned north–south, was exposed close to the shore of the Kinneret. Several rooms were uncovered west of the paved area and part of the basement level of a large building, which was divided into different size rooms, was exposed east of the paved area (Figs. 3, 4). Two openings were set in the building’s western façade. Numerous whole pottery and glass vessels were discovered in one of the rooms and the bases of two large storage jars, standing in situ, were discovered in a nearby room. The eastern side of this large structure rested up against a wide stone wall (width 1.8 m) that was apparently used as a quay on the shore of the Kinneret. Fieldstones and large pebbles that probably served as a breakwater designed to protect the wall from the Kinneret’s waves were discovered at the eastern foot of this wall. One of these stones was a fragment of an anchor or a tethering stone. The building might have been used as a storeroom near the anchorage on the shore. Area C (Fig. 5). The northwestern side of the settlement was exposed 500 m west of the building in Area A; it contained the remains of a street and buildings. The street (width c. 1.5 m), oriented east–west, was paved with small round stones. Remains of structures built of roughly hewn basalt stones were exposed on both sides of the street. Floors of stone or crushed tamped chalk were discovered in several of the structures. Three phases of construction were discerned in the architectural remains. The early phase was destroyed and buildings were put up above it in the middle phase, which in several instances utilized the walls of earlier structures. Repairs to the buildings were made in the last phase and an industrial quarter was uncovered. Four buildings with an identical architectural plan were exposed in this quarter. Each of these structures had a stone floor and alongside it were four small pools (c. 0.5×0.5×0.7 m; Fig. 6), some with plaster still preserved in them. A narrow rectangular shaft with steps that led to its non-paved bottom was exposed next to the pools. The shaft was presumably flooded with ground water. The water in the shafts might have been used to fill the pools, or the pools might have served as small reservoirs. It is possible that the buildings in this quarter were used in conjunction with the fish industry, although at this stage, this hypothesis can not be substantiated. A synagogue was exposed north of the road, at its western end. Three construction phases, corresponding to those discerned in the building (see above), were identified in the excavation of the building. 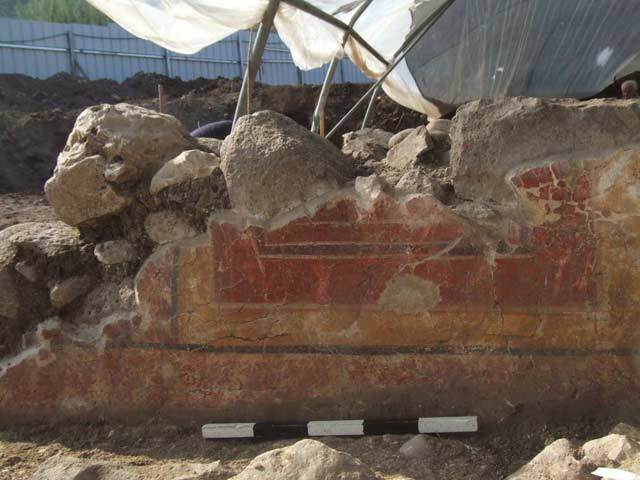 Remains of a building, which was dated to the mid-first century BCE based on the finds, were ascribed to the early phase; it was probably not used as a synagogue. It swerved as such in the two later phases. The latest phase of the synagogue, which was preserved in its entirety as it was when abandoned, is described below at length (Fig. 7). The synagogue consists of two large rooms—a vestibule and a reading room—and one smaller room. It seems that the entrance to the synagogue, whose remains were not discovered, was set in the structure’s western wall and led from the outside into the vestibule, which was long and narrow. Next to its walls on the inside, a stone-paved corridor was built (Fig. 8); this corridor was bounded within a stone framework. The floor in the middle of the vestibule was composed of tamped earth and crushed chalk, and in its center stood a square limestone block in secondary use that might have been used as a base for a chair or table. The floor around the stone consisted of basalt flagstones. The vestibule might also have been a kind of small seminary used for studying. A doorway in the eastern wall of the vestibule led into the reading room (Fig. 9). The room was surrounded on all sides by a raised corridor, around which a stone bench was built that incorporated architectural elements in secondary use in its construction. This corridor was delimited on the inside within a framework that might also have been used as a bench. A mosaic floor was exposed in the eastern part of the corridor. A rosette pattern flanked on either side by a strip adorned with a meander pattern, is found in the center of the mosaic. This pattern is evenly and precisely severed at both ends and therefore it seems that the construction of the mosaic floor was interrupted shortly after the work had begun. A foundation of a mosaic pavement, composed of small stones, was exposed elsewhere in the corridor. Two parallel stylobates were built in the reading room and two fragments of basalt columns were discovered in situ, standing on top of them. A fragment of another basalt column was discovered lying on the floor of the room. A level of small tamped stones, probably the foundation of a mosaic pavement, was exposed in the middle of the reading room. E. Netzer suggested that six columns were in this building, supporting the ceiling. The walls of the room and the columns were covered with a colorful fresco, consisting of dark red, mustard yellow and blue panels set within black and white frames (Fig. 10). It seems that the building’s ceiling was built of wooden beams and mortar, and coated on the inside with white plaster. A rectangular stone with four feet was exposed on the level of small stones in the room. Five of the stone’s sides were decorated in relief. On one of those sides was a relief of a seven-branch menorah (candelabrum) with a triangular base standing on a square structure (Fig. 11). The menorah was flanked on either side by amphorae and columns. 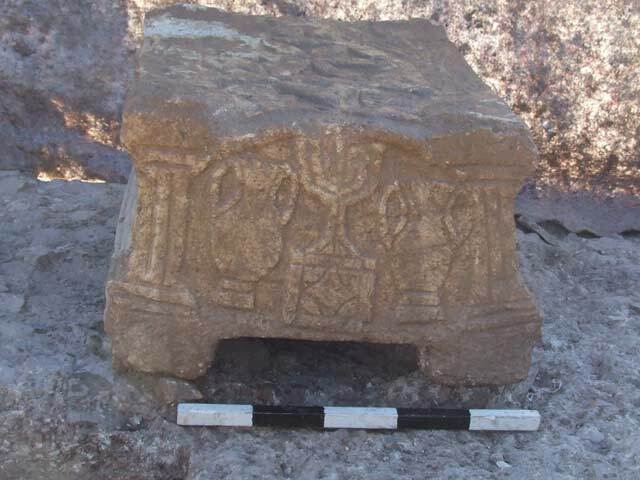 It seems that the stone represents the Second Temple and it was used as a prayer table. In the southwestern corner of the reading room was a small room divided in two by a partition wall. This room was paved with a mosaic and its walls were also decorated with a colorful fresco. The room might have been used to store the scrolls. Area D. A channel (width c. 4 m; Fig. 12) whose sides were built of round fieldstones and several roughly hewn stones was exposed. It seems that it was meant to convey water from Nahal Arbel to the Kinneret in the winter, to protect the settlement’s houses and farmland from flooding. The ceramic finds of Stratum 3 date from the year 50 CE until the end of the first century CE. Noteworthy among these are vessels that resemble those produced in the workshop at Kefar Hananya, and also jars known from the Jewish settlements and clay lamps with a pared nozzle. Knife-pared limestone “measuring cups” were also discovered. The glass artifacts from Stratum 3 include fragments of bowls, bottles, and a stopper that date from the beginning of the first century CE to the year 40 CE. The initial examination of the coins discovered in the stratum identified Hasmonean coins and coins from the first century CE. Included among them is a coin from the year 43 CE that was discovered in the foundation of the mosaic in the reading room, a coin from the Year 2 of the Great Revolt that was discovered on the street and a coin from 80 CE that was found on the ceiling collapse of the synagogue. A road (width c. 2 m), aligned northwest–southeast, was built on top of a thin layer of alluvium that overlaid the remains of the building from the Early Roman period in Area A (Fig. 3). The road was paved with fieldstones and the curb walls on both of its sides were preserved two courses high. An aqueduct built on a small bridge that passed over the channel of a stream was exposed north of Area C. It seems that the aqueduct conveyed water from the nearby ‘En Nun to fields for irrigation. Nearby in Area D, a circular pool (diam. c. 13 m; Fig. 13) was exposed. It was built and paved with roughly hewn basalt stones. A hole in the southern side of the pool drained the water from the installation. The aqueduct might have been used to convey water to fill the pool. 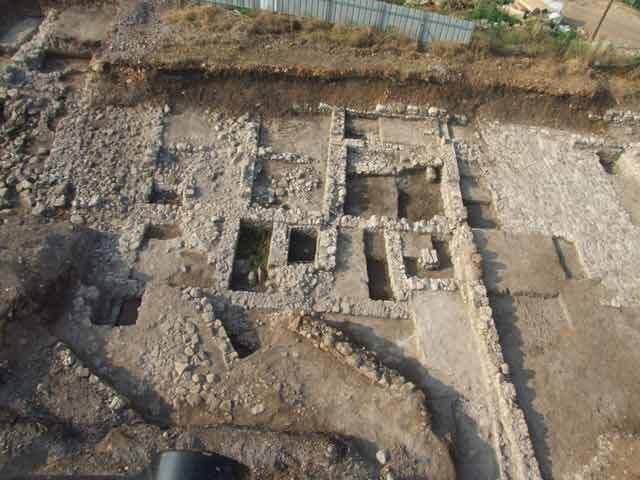 The northern quarter of a Jewish settlement dating to the beginning of the Roman period was exposed in the excavation. The quarter was founded on an alluvial fan of Nahal Arbel, and it included dwellings that were built of roughly hewn basalt stones, a stone-paved road and a synagogue. 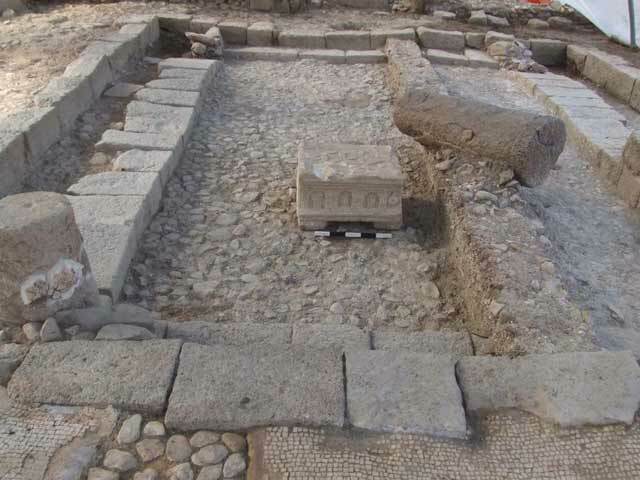 It seems that the synagogue is the earliest one discovered so far in the Galilee and one of the few from this period to be found in the entire country. The seven branched menorah chiseled on the stone in the synagogue is the earliest menorah from the Second Temple period to be discovered outside of Jerusalem; it is also the earliest menorah ever discovered in a religious structure. The excavation revealed that the quarter and the synagogue were probably deserted at the time of the Great Revolt. Josephus describes the Roman victory over the zealots, and the excavation revealed that the Roman conquest resulted in the abandonment and destruction of the site. The building stones of the abandoned structures and the ruins were apparently taken for construction elsewhere. The drainage channel from this period became blocked and brown heavy alluvium covered the settlement remains. Since the quarter was abandoned at the end of the first century CE, the region was not reoccupied until the construction of the holiday village in the 1970s. De Luca S. 2009. La città ellenistico-romana di Magdala/Taricheae. Gli scavi del Magdala Project 2007 e 2008: relazione preliminare e prospettive di indagine. Liber Annuus 59:343–562. 3. Area A, a stone plaza and architectural remains, looking east; in the upper part—a road. 4. Area A, looking south. 5. Area C, a street with buildings on both sides, looking west. 6. Area C, built pools, looking north. 7. Area C, the synagogue, looking west. 8. Area C, the vestibule in the synagogue, looking south. 9. Area C, the reading room, looking west. 10. Area C, a fresco on a wall of the reading room, looking west. 11. Area C, a decorated stone. 12. Area D, a stone channel, looking west. 13. 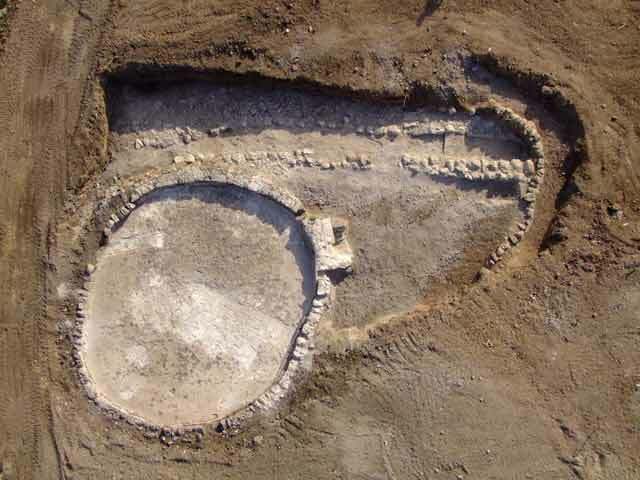 Area D, a circular pool, aerial view looking east.